Curious just how far your dollar goes in Philadelphia? Take a peek at what rentals the city has to offer, below. Listed at $1,400 / month, this 1-bedroom, 1-bathroom apartment is located at 971 N Lawrence St. In this unit, you'll find hardwood floors, granite countertops, stainless steel appliances, a dishwasher, in-unit laundry and air conditioning. If you've got a pet, you'll be happy to learn that cats and small dogs are welcome. According to Walk Score's assessment, the surrounding area is extremely walkable, is convenient for biking and boasts excellent transit options. Next, there's this 1-bedroom, 2-bathroom apartment over at 3031 W Colona St., also listed for $1,400 / month. In the unit, there are hardwood floors, closet space, ceiling fans and exposed brick. Building amenities include outdoor space, though animals are not allowed. Per Walk Score ratings, this location is very walkable, is very bikeable and has good transit options. Located at 514 South St., here's a 477-square-foot 1-bedroom, 1-bathroom apartment that's listed for $1,400/ month. In the furnished unit, there are a mix of hardwood floors and carpeting, recessed lighting, stainless steel appliances, both air conditioning and central heating, floor-to-ceiling windows, a dishwasher and in-unit laundry. As for building amenities, expect an elevator, on-site management and package service. Small pets are permitted. According to Walk Score, the surrounding area is extremely walkable, is quite bikeable and has excellent transit. 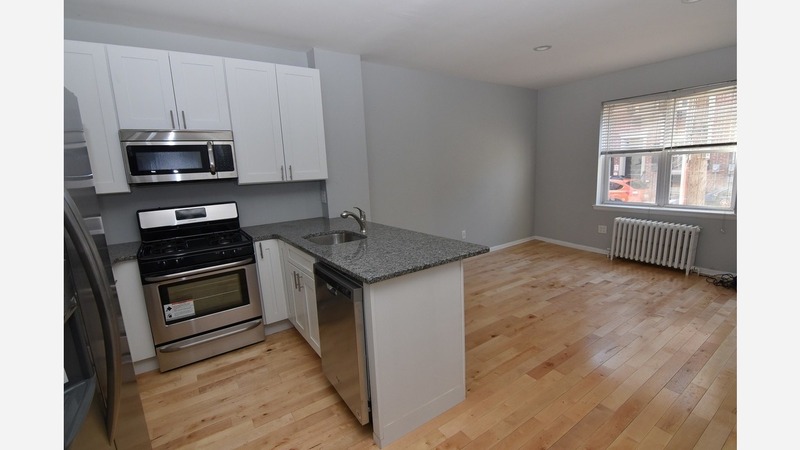 Listed at $1,400 / month, this 1-bedroom, 1.5-bathroom apartment is located at 2104 Spruce St. In the apartment, you can expect a dishwasher, in-unit laundry, hardwood floors, floor-to-ceiling windows and wooden cabinetry. Amenities offered in the building include outdoor space. Pet owners, inquire elsewhere: this spot doesn't allow cats or dogs. According to Walk Score, the area around this address is a "walker's paradise," is easy to get around on a bicycle and boasts excellent transit options. Next, there's this 1-bedroom, 1-bathroom apartment situated at 314 S 12th St. It's listed for $1,400 / month. Tenants can expect the unit to feature hardwood flooring, high ceilings, a fireplace, air conditioning, a dishwasher and recessed lighting. When it comes to building amenities, expect on-site laundry and outdoor space. Pets are conditional on owner's approval. According to Walk Score, the surrounding area has excellent walkability, is great for biking and is a haven for transit riders. Here's a 950-square-foot, 1-bedroom, 1-bathroom spot at 3425 W School House Lane that's going for $1,400 / month. In the rental, which has its own separate entrance, you can expect in-unit laundry, hardwood floors, a private patio and ample natural light. The main house features garage parking and outdoor space. Cats and dogs aren't allowed. According to Walk Score, the area around this address is car-dependent, has minimal bike infrastructure and offers many nearby public transportation options. Finally, check out this 1-bedroom, 1-bathroom apartment that's located at 30 S 22nd St. and listed for $1,395 / month. In the unit, you'll get hardwood floors, high ceilings, a decorative fireplace, built-in bookshelves, a ceiling fan, granite countertops, stainless steel appliances and a dishwasher. The building boasts on-site laundry, outdoor space and storage. Good news for cat lovers: kitties are welcome. According to Walk Score's assessment, this location is a "walker's paradise," is a "biker's paradise" and is a haven for transit riders. 76ers' Team President Thanks Fans For Believing In "The Process"